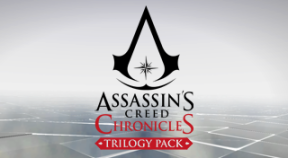 Complete Assassin's Creed® Chronicles: China, Russia and India. Assassinate Gao Feng in Assassin's Creed® Chronicles: China. Complete Assassin's Creed® Chronicles: China. Complete every memory in the Plus or Plus Hard Game Modes of Assassin's Creed® Chronicles: China. Achieve the highest score and fastest time in each memory of Assassin's Creed® Chronicles: China. Kill 100 enemies using the Helix Kill in Assassin's Creed® Chronicles: China. Slide assassinate 25 enemies in Assassin's Creed® Chronicles: China. Shadow Gold past 30 patrols in Assassin's Creed® Chronicles: China. Escape alerts 30 times in Assassin's Creed® Chronicles: China. Escape the burning port in under 5 minutes in Assassin's Creed® Chronicles: China. Assassinate all enemies in the ambush without taking a single hit in Memory Sequence 8 of Assassin's Creed® Chronicles: China. Save all the Concubines in Memory Sequence 9 of Assassin's Creed® Chronicles: China. Complete Assassin's Creed® Chronicles: China Memory Sequence 11 without being seen. Hide 50 bodies in Assassin's Creed® Chronicles: China. Collect all the Animus Shards in Assassin's Creed® Chronicles: China. Open all Scroll Chests in Assassin's Creed® Chronicles: China. Assassinate 100 enemies in Assassin's Creed® Chronicles: China. Kill 100 enemies from combat in Assassin's Creed® Chronicles: China. Inflict friendly fire from projectiles on 50 in enemies Assassin's Creed® Chronicles: China. Complete Memory Sequence 1 in Assassin's Creed® Chronicles: India. Achieve the highest score and fastest time in each memory of Assassin's Creed® Chronicles: India. Complete Assassin's Creed® Chronicles: India without killing anyone. Complete Assassin's Creed® Chronicles: India in Plus Hard mode without being seen once. Pickpocket or Loot 100 enemies without being seen in Assassin's Creed® Chronicles: India. Use the Smoke to pass by 100 enemies in Assassin's Creed® Chronicles: India. Multi kill 200 enemies in Assassin's Creed® Chronicles: India. Take down 100 enemies in Assassin's Creed® Chronicles: India. Have 100 enemies pass by you whilst using Helix Blend in Assassin's Creed® Chronicles: India. Dispose of 100 enemies using Helix Blade in Assassin's Creed® Chronicles: India. Achieve Shadow Gold Style rating 30 times in Assassin's Creed® Chronicles: India. Achieve Assassin Gold Style rating 30 times in Assassin's Creed® Chronicles: India. Achieve Silencer Gold Style rating 30 times in Assassin's Creed® Chronicles: India. Reach the maximum score multiplier in any Assassin's Creed® Chronicles: India memory sequence and maintain it for two more sections. Rescue Hamid in under 5 minutes in Assassin's Creed® Chronicles: India Memory Sequence 3. Complete Assassin's Creed® Chronicles: India Memory Sequence 4 in under 9 minutes. Clear the Mortar Guards without taking any damage in Assassin's Creed® Chronicles: India Memory Sequence 8. Complete Assassin's Creed® Chronicles: India Memory Sequence 9 in under 7 minutes. Complete Assassin's Creed® Chronicles: Russia Memory Sequence 1. Complete Assassin's Creed® Chronicles: Russia Memory Sequence 3. Complete Assassin's Creed® Chronicles: Russia Memory Sequence 6. Complete Assassin's Creed® Chronicles: Russia Memory Sequence 8. Achieve a Shadow Gold rating 30 times in Assassin's Creed® Chronicles: Russia. Achieve a Assassin Gold rating 30 times in Assassin's Creed® Chronicles: Russia. Achieve a Silencer Gold rating 30 times in Assassin's Creed® Chronicles: Russia. Don't kill any enemies in the Orelov Sniping sections in Assassin's Creed® Chronicles: Russia Memory Sequence 7. Complete Assassin's Creed® Chronicles: Russia Memory Sequences 8 and 9 without killing anyone. Headshot 100 enemies in Assassin's Creed® Chronicles: Russia. Electrocute 25 enemies in Assassin's Creed® Chronicles: Russia. Electrocute 3 enemies at the same time in Assassin's Creed® Chronicles: Russia. Use Helix Blade on 25 enemies in Assassin's Creed® Chronicles: Russia. Complete Assassin's Creed® Chronicles: Russia Memory Sequence 4 without alerting the enemies. Complete Assassin's Creed® Chronicles: Russia. Complete any Memory Sequence other than Memory Sequence 1 without losing your Score Combo once in Assassin's Creed® Chronicles: Russia. Complete Assassin's Creed® Chronicles: Russia in Plus Hard mode without alerting any enemy.